Wednesday February 6th 1884 I got the rest of the clothes down this morning and washed all the new sheets and put them up and ironed in the afternoon while Julia was gone to town. I finished my quilt. Mollie Stevens came here tonight to board for three weeks to teach school. Thursday February 7th 1884 I was nearly sick with a cold. Rob seemed to be improving a little. Hatt was over a few moments and says the children are both sick and she has only a small girl to help and is nearly tired out. 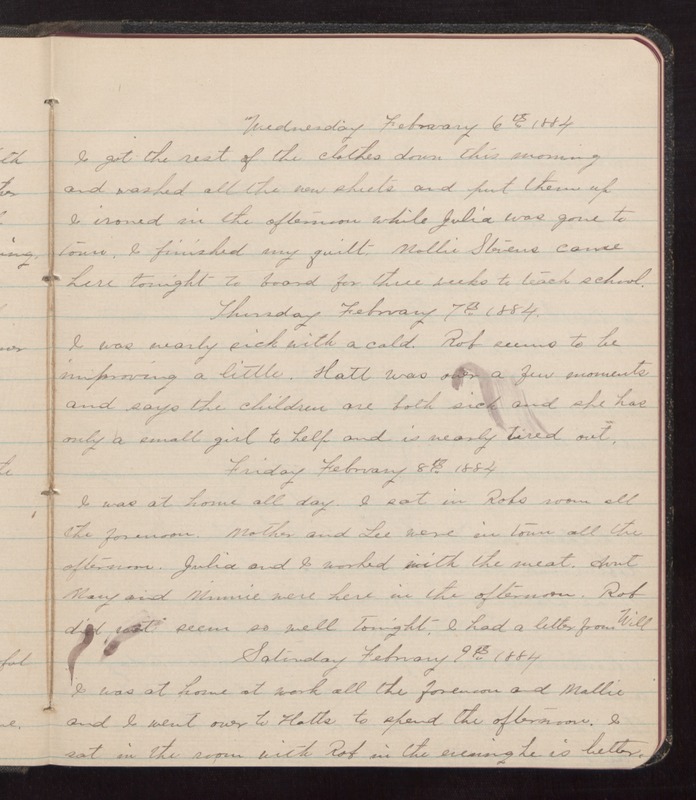 Friday February 8th 1884 I was at home all day. I sat in Robs room all the forenoon. Mother and Lee were in town all the afternoon. Julia and I worked with the meat. Aunt Mary and Minnie were here in the afternoon. Rob did not seem so well tonight. I had a letter from Will. Saturday February 9th 1884 I was at home at work all the forenoon and Mollie and I went over to Hatts to spend the afternoon. I sat in the room with Rob in the evening he is better.